With Father's Day right around the corner, I figured now would be a great time to think about what we should get Ray for his day. With a 19 month old and a 7 week old, by "WE", I really mean "I". Ray is such a great dad. I’m sure most of you probably feel the same way about the dad in your life if you are reading this Father's Day gift guide. I literally count down the minutes until 6:00 when Ray gets home everyday. He gets a very fun phone call/text everyday at 4:30..."so when are you going to be home?" Nope. That's not annoying at all :) Right when he walks through the door, he is "ON." He does the entire bedtime routine with Charlie every night. More important than being present in our day to day life is how I can always rely on him no matter what. For the big things and the little things, he always delivers. Juggling two babies under two is not easy and I can confidently say he makes me feel like we have this parenting thing completely under control...just kidding. He does make me feel like I chose a spouse that will always be in our children's lives, not just physically, but also emotionally, everyday. When thinking about marriage, a non-negotiable (yes, I had non-negotiables) was someone that would have their own strong relationship with our children, a truly involved Dad that would be in our children's lives more than "How was school today?” When I met Ray, I not only fell in love with him but also knew he would be the kind of father that I wanted for my children. So, he deserves a little better than an OK gift on Father's Day. Ray has a terrible back. RIght before I delivered Ford he actually threw it out and ended up in the hospital. I blame it on working a 6-6 job and sitting in a chair at the computer for the last 14 years. That being said, his back is in need of some TLC. I'm getting Ray a gift card to, Indigo Acupunture + Wellness. Acupuncture can help your body heal itself from many issues including acute and chronic pain. This is the perfect gift for the husband that could benefit from something like this, but might not make an appointment on his own. If you live in the area, check out the Indigo Acupuncture & Wellness website, HERE. If you are married to the man that loves gifts made for them then this is for you! Mackenzie Horan of the blog Design Darling posted about how she was doing needle point to create a belt for her husband, so... I had to learn more! There are companies that can ship you the entire kit to get started and there are YouTube videos for needle point for beginners. 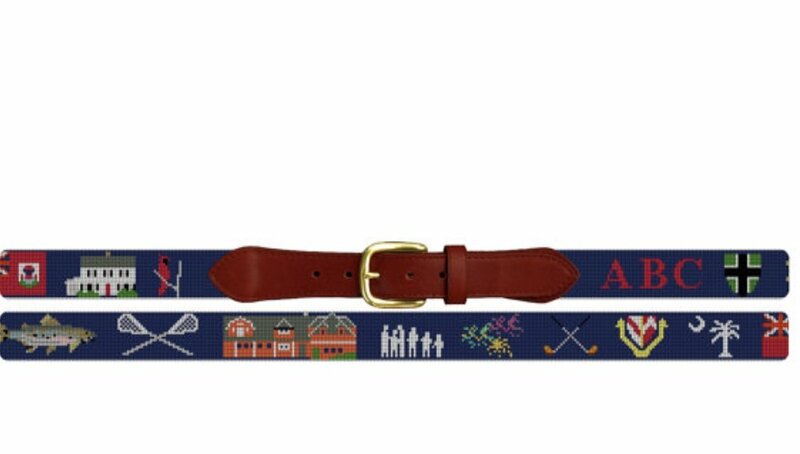 The best part is that YOU get to pick out symbols to put on the belt that best describes your dad/husband. This could also be a fun family project because your kids can also pick out symbols that describe dad. 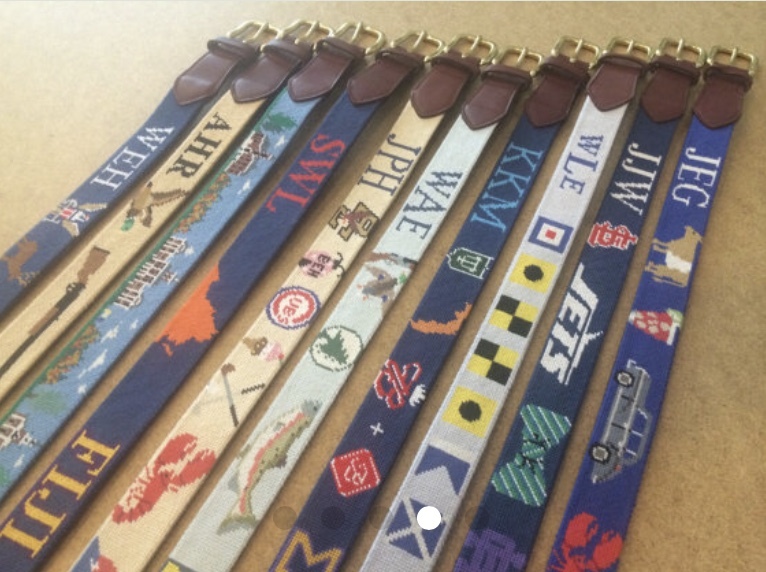 If you don't have the time to actually needlepoint, then you can have the belt custom made....a little white lie never hurt anyone. You can check out the company’s ETSY page, HERE. You can check out the company’s website, HERE. You know those really cool prints that are thousands of dollars and literally look like your kids accidentally spilled milk all over them? Me too! So why not just create that and frame it? I love the side by side ones. All you need is non toxic paint, 2 large pieces of textured paper and 2 frames. You could have the kids squirt bottles full of paint on the paper. Do one color and let it dry. I would stick to three colors in the same color family. After the paper dries you can then hang them up on father’s day morning before dad wakes up! What guy doesn't love a good monogram? Monogrammary is your go-to for everything personal. If your husband is in need of a DOBBS kit, travel bag, apron, or tie holder then she is your girl! EVERYTHING can be monogrammed. You can find her website, HERE. Speaking of men’s aprons.... let's talk about meat. I'm a huge believer in eating top quality grass fed & grass finished beef. I promise your husband will not taste meat as good as the stuff right from the farm. You can actually order a cow or pig straight from local farms. The meat comes vacuumed sealed in individual cuts just like the grocery store. If freezer space is an issue you can split the cow or pig with someone else. I happen to do a cow share with my parents. We get our meat from, HERE. It's a farm in Woodstock, CT. There are so many places that do this. You can find farms near you on google. A personal training session would be a wonderful Father’s Day gift. If your husband complains about not having time to get to the gym or often talks about how he wants to get back at it, then this gift is for him. Sometimes it just takes a few personal training sessions to get back into healthy habits after a long break from working out. Booking your husband a personal trainer could be the perfect Father’s Day gift. If you are local, check out Countdown Fitness. I went to personal trainer, Madison, and loved her! If your significant other is short on time like mine is, they will still be able to make time to go to Countdown Fitness because their sessions are only 30 minutes long. That’s because they use the slow burn method. They have gyms in both Greenwich & New Canaan. You can find their website, HERE.